Search for the best flight prices from Manchester to Paphos. Compare prices, book today and save money with Manchester Airport. For the warmth of its climate – and its welcome, with myth and legend, history and hospitality in equal measure and Paphos is no exception. In fact, it has it all with a rather British colonial twist in which cars still drive on the left. It’s as you’d expect from the home of Aphrodite, Goddess of Love. 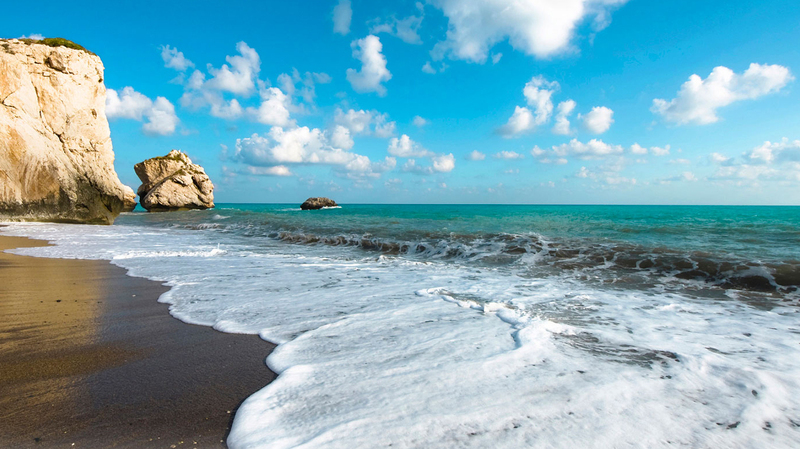 The birthplace of Aphrodite hosts eight months of summer weather annually, making it the destination of choice for sun-worshippers. Lap up the heat in style at sumptuous Amathus Beach Resort (Poseidon Avenue), with its luxury spa and spacious, modern rooms. Or head a little further out of town to the Thalassa Boutique Hotel & Spa (Coral Bay Main Road) where you'll indulge in opulent living next to the beach. Right in town and down the price scale, Anna Hotel Apartments (15 Evagorou Street) is a solid choice with friendly staff, while wallet-friendly holiday seekers will appreciate family-run Axiothea Hotel (2 Ivis Mallioti Street). Delicate handmade lace and scrumptiously chewy loukoumia (a local sweet) are two favourite Paphos souvenirs. The harbourside is a good starting point for your shopping in Paphos, with a road lined with dinky shops selling a decent range of lace, leather goods and local foodstuffs. For antiques, more of that lace and Cypriot ceramics, rummaging along the stores and boutiques of Makariou Avenue should result in a find. The covered market, slap in the centre of Paphos’ Old Town, along Nicodimou Mylona Street, is the place to head for bargain-priced local textiles, jewellery and art. Well-priced dining, super-fresh seafood and full-bodied Mediterranean flavours sum up Paphos' restaurant scene. For romantic views out over the harbour and fantastic meze (starter plates) spreads, Ouzeri (12 Poseidonos Avenue) can't be beaten. Wholesome Cypriot flavours, doused in olive oil, at good-value prices, are what the town's many 'taverna' restaurants are all about. Les Amis (Kleious Street) and Akis Tavern (Airport Road) are two of the best. For a beer and a boogie, the place to go is Agiou Antoniou Street (known as 'Bar Street') in the harbour area. Boogies Bar has some of the cheapest drink prices along the strip, while Robin Hood is one of the better clubs if you just want to dance the night away. With the marathon starting point at Petra Tou Romiou (the birthplace of Aphrodite) and the finish line at Paphos' Medieval Fort square, this is a run through history as well as a race. There's a half marathon and a 10km fun run organised at the same time. This one-day festival is a celebration of the ancient Olympics which has its roots here on the island. Spring's arrival is heralded all over Cyprus with the annual Flower Festival. In Paphos, the local parade turns the seafront road into a riot of colour for the day. This traditional religious festival takes place 50 days after Orthodox Easter. In Paphos, the harbour area is the setting for all the action with a series of folk dance performances, concerts and watersports activities organised. This national festival hosts a program of ancient Greek dramas performed at various venues across the island. In Paphos, the plays take place in the atmospheric ancient Odeon.